The laparoscopic bipolar cautery instruments can have important differences. The working length of the instrument may vary. It is important to choose a length that will allow the tips to easily reach the target tissue when the instrument is passed through the laparscopic trocar (which has been placed within the abdominal wall). 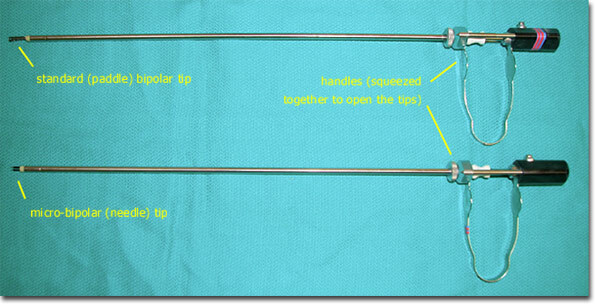 The handles generally have a “U spring” configuration such that the tips open up (to grasp tissue to be cauterized) when the handle is pinched together. The tips then close when the handle is released (no longer actively pinched together) since it naturally “springs” back to its original (closed) position. The tips of the instrument are (positive and negative) electrodes. Current passes from one electrode to the other electrode (when activated by stepping on a foot pedal or other similar device) through the target (grasped) tissue, effectively cauterizing the contained tissue. This coagulates the contained tissue to stop bleeding (establish hemostasis).